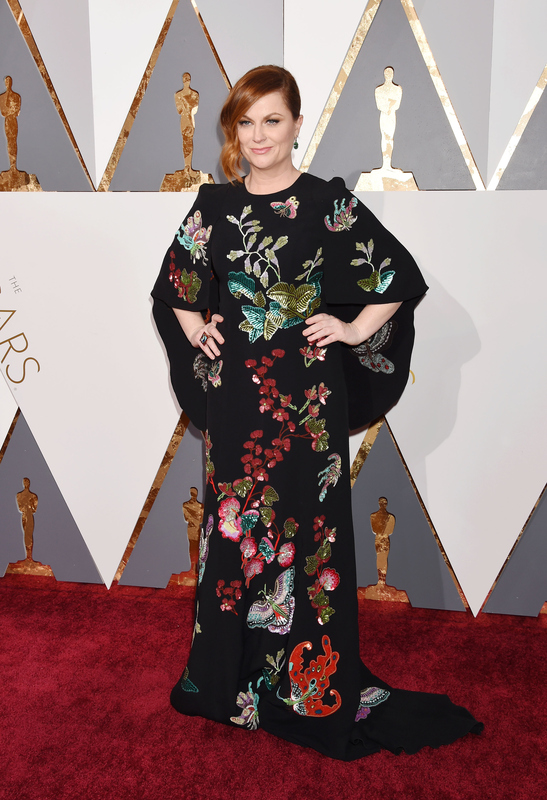 There was nothing funny or comical about Amy Poehler's edgy Andrew Gn Oscar frock. And it's what inspired her total look, says her makeup artist Brigitte Reiss-Andersen, who used Kiehl's Since 1851 and Elizabeth Arden on the actress. In short, says Reiss-Andersen, Poehler "is most delightful person on two feet. She knows what she needs. She's done this a million times. The dress was the deciding factor. I had a million plans in my head. We could do a smokey eye. But then you see the dress." And that hair. "It's a gorgeous copper hue. I used a green pencil to pop the eyes. She's got a ton of lashes. We did amp that up a little bit," says Reiss-Andersen, with her go-to product being the brand new Elizabeth Arden Grand Entrance Mascara. Another major product: Kiehls Turmeric & Cranberry Seed Energizing Radiance Masque. As for where they got ready, get this, guys: "We went to her office. It's a beautiful cottage situation with a backyard. We opened the door. The birds were chirping. I couldn't believe it. She's so zen about the whole thing. She's not nervous. She's done it a trillion times. She'll walk the carpet. She'll have a blast."